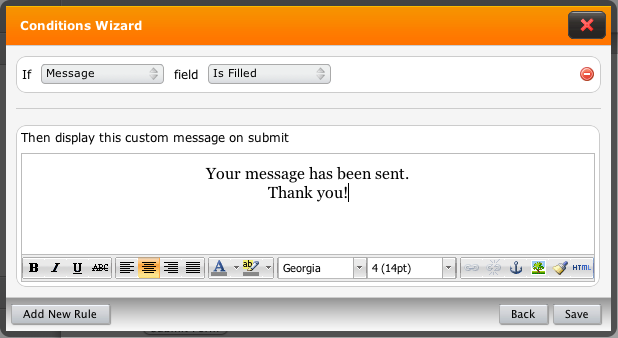 When I apply fonts and colours to the thank you message they only appear as they should if I submit a blank form, when the form is completed, the message defaults to verdana. I'm using georgia bold 14pt orange. We are aware of the problems on the HTML editor for the Thank you page. We will soon replace it with a new one. It is in the works. Thanks for your patience. Thanks for your quick response. When the problem is fixed will I have to re-do my form or will it just start working correctly without me having to change anything? Any idea when it will be fixed? Other than this little problem, my form is working great. Thanks. We have actually fixed the Thank You page HTML editor on Saturday. Please try it now. Open the Thank You page code and try to change it as you wish. It should work well now. Yeah, it's still not working. The code is there and it works when the form is sent blank but doesn't work when the form is filled in. It's still reverting to black verdana, it is maintaining the correct point size however. You have two versions of the Thank You page. One is on the "Conditions". You must update both when you make changes. Thanks - I'm an idiot!